Historically a number of local East Bay watersheds that drain into San Francisco Bay supported significant runs of steelhead trout and salmon. Development, dams, and drought have done severe damage to these fish. But the heavy rains during the winter of the 2016-17 offered new hope for the return of native steelhead to Alameda Creek. On March 23, 2017 about 30 volunteers with the John Muir Chapter of Trout Unlimited, Alameda Creek Alliance, Diablo Valley Fly Fishers, and Grizzly Peak Fly Fishing Club helped fish biologists from the East Bay Regional Park District and the California Department of Fish and Wildlife net five adult steelhead trout below the weir. Radio transmitters were attached to five steelhead so their upstream migration could be tracked by Park District biologists. The steelhead were then transported to a point above the most upstream rubber dam. The following week four more steelhead captured below the weir and one was tagged. Two of the steelhead were too small for a transmitter, and one was a hatchery fish which was released below the weir. Steelhead continued to be spotted in lower Alameda Creek below the weir throughout March. One radio tagged steelhead was tracked to the upper Sunol Valley, about 23 miles from the Bay. 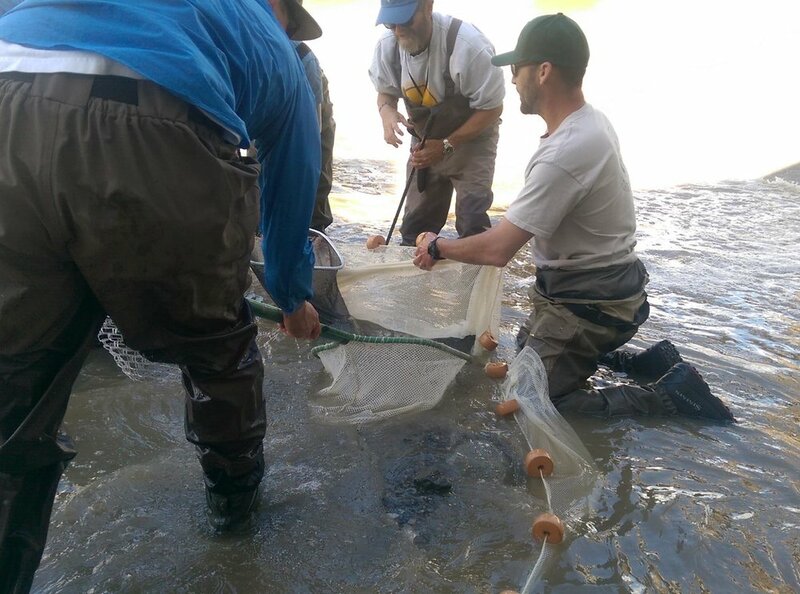 DNA testing of fins clips from adult steelhead below the BART weir compared to testing of rainbow trout in Alameda Creek indicates that the returning adult steelhead are native to the watershed. One might ask how this is possible given that the weir is a complete barrier to upstream migration, and the capture and transport of fish past these barriers has been limited to only a few wet years. We asked that question to Dr. Rene Henery, a senior fisheries biologist with TU California. One possibility is that some juveniles from resident trout are out-migrating; in fact fyke fish traps in upper Alameda Creek have detected a few smolts in recent years. If this is the case, protecting resident trout in headwater areas may be key to restoring native steelhead runs in some of our streams in the Bay Area. Newer PostWhen does a species go extinct?